In war it’s a commonplace to say it’s the winner who tells the story. It’s less well understood that the story doesn’t win the war. In other words, war is won on the field by force. Info-war decides what people, who don’t fight, don’t vote, and don’t count, think afterwards. Afterwards is always a long time. What happened at the Battle of Aleppo (lead image, 1) is that Russian and Syrian forces, fighting for the Syrian government in Damascus, defeated the forces of the US and the NATO alliance, fighting with mercenaries they hired to overthrow the government in Damascus. This is the most decisive defeat of US strategy and arms since 1975, when Vietnamese forces won the second Battle of Saigon. US Government propaganda – whether published in the US or through English, Canadian, Turkish or Dutch paid proxies – is attempting to explain their defeat on the field of battle in Syria by alleging war crimes on the part of the winning forces against women and children. The propaganda ignores the war crimes of those who started the war in Syria and occupation of Aleppo in the first place. Like the rewriting of the history of the US wars which have destroyed, and continue destroying, Yugoslavia, Afghanistan, Pakistan, Iraq, Libya, Georgia, Ukraine, etc., defeat is one thing on the ground; another thing on the page where it doesn’t count. 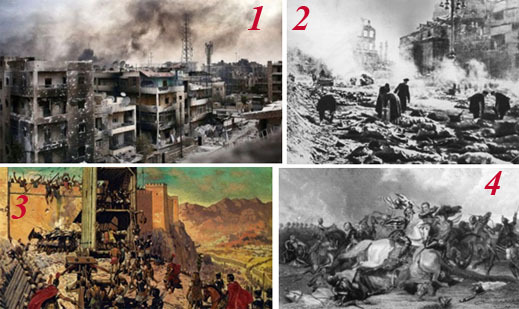 In counting like this, the slaughter of innocents isn’t new. By the way, fomenting and broadcasting hatred of Russians as child-murderers, like hatred of Jews as child-sacrificers, or of Afro-Americans as child rapists, is a crime too. The concentration camp weapon, which Adolf Hitler used to murder millions of innocent women and children, was the invention of the British in South Africa in 1899 and in Iraq in 1920, as well as the Italians in Libya in 1911. Calculate the proportionality of Boer, Libyan and Iraqi casualties to the civilian populations from which the victims were taken, and you will arrive at a ratio that is genocidal in outcome, as it was in intention. British policy was genocidal towards the Boers, as was Italian policy towards the Libyans. In their genocide of the Armenians, the Turks saved themselves the cost of setting up concentration camps by the expedient of marching the victims to their death (pictured below). Hitler’s genocide of the Jews required a larger capital cost, plus records, which have enabled the subsequent understanding of what happened, and the conviction of some of those responsible. The US Strategic Bombing Survey (USSBS) allows you to study the military value, and also civilian cost, of the bombings of German and Japanese civilians. Read the civilian cost sections for Germany here; and for Japan here. This is evidence of the bombing of Germany and Japan as war crimes by the winning side; that is according to the tests of intentionality, wanton destruction, and absence of military necessity which are the three prosecution tests in the Statute of the International Criminal Court, Article 8. What isn’t clear from Article 8 is how “civilian”, “protected person”, “military necessity” and “military objectives” are defined in a civil war, financed and armed from the outside, to take a country’s territory, cities, and population away from the jurisdiction of the government whose overthrow is the outsiders’ aim for the war. Article 8 adds that it is a war crime to “utiliz[e] the presence of a civilian or other protected person to render certain points, areas or military forces immune from military operations”. In civil war such distinctions can’t be made because they are part of the conflict – so, is starting a civil war a war crime? Is it a war crime to fight back? The answers to these questions are given by both sides. Outside the killing grounds, though, the answers are more likely to be remembered, and believed, when they are given by the war winners, not by the war losers. The big guns of propaganda fail if they don’t win on the ground; the further they are away from the ground, the bigger they sound, the less they win. Still, history is longer than we are, and the question-marks which war crimes leave behind can be turned on their heads many times over. Just so, our understanding of the truth. The stories of two of the greatest battles ever fought over a single place illustrate that, if history runs for long enough, there is time to reinterpret the outcome of the battle. 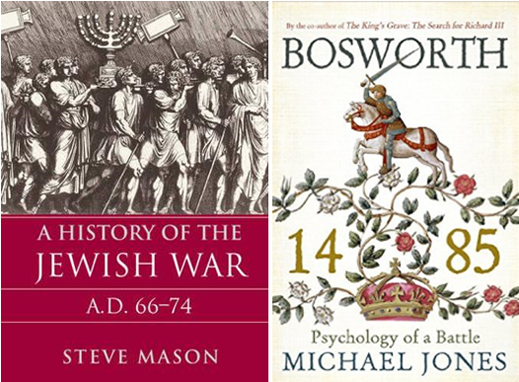 Take the Battle of Masada (lead image, 3) and the Battle of Bosworth Field (4), for example. The first, dates from the spring of 73 or 74 (the date isn’t certain) and is still interpreted as the courageous last stand by the Judaeans in their eight-year war against the Roman empire’s legions. The second took place on August 21, 1485, and marked the defeat (and death) of King Richard III of England by Henry Tudor, who took the kingship as Henry VII. The first battle is an icon of Zionist ideology and Israeli national identity, founded on the idea that a thousand defenders of Masada defended themselves for more than a year before committing mass suicide, as the male fighters killed their wives and children before killing themselves. The second is a Shakespeare play about a hunchbacked killer of children whose army refuses to fight for him, and whose last words on the battlefield – “A horse! a horse! my kingdom for a horse!” – are those of a coward offering a bribe as he tries to run away. These stories of battles which took place 1,942 years and 531 years ago are false, no matter how many people believe otherwise. The evidence, assembled by archeologists, historians, and forensic pathologists who are still working on the bodies, portrays completely different events. Read the details in these new books. Masada, it turns out, wasn’t a battle at all. There were several dozen males of fighting age and fewer than 500 people in the fortress at the end. The Roman siege lasted weeks, not months or years; the war in Judaea had ended more than a year earlier. The truth is that Masada was a camp for displaced persons who had taken over an abandoned royal residence after fleeing the real battles to the north, around Jerusalem. Without being able to grow crops or trade anything of value, the Masadan males lived off stealing, stick-ups, and raiding crops and livestock from the Judean settlements in the plain below their fort. In today’s terminology, they were not even terrorists or jihadis. When Silva, the governor of Judaea and commander of the siege legions, offered terms of surrender, the men didn’t think gangsters like themselves were included. They didn’t allow the women and children a choice. The defiant speeches at the end are figments of subsequent legend-making. 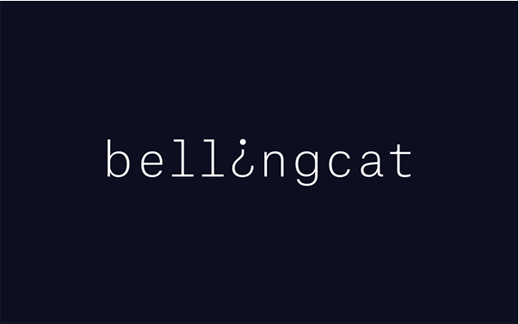 Ancient bellingcat. The battle of Bosworth Field was the real thing, but it didn’t occur where it has been supposed for a half-millennium. Richard and his army fought well, but they were out-flanked; blind-sighted by an unusually bright English summer sun. Richard spotted Henry, on foot (unhorsed), and in the rear of his line. So Richard launched the full line of his cavalry, himself leading from the front, with the aim of killing Henry. Richard and his cavalrymen then ran into a manoeuvre and military technology they hadn’t seen before. This was a formation of Swiss-trained French pikemen whom Henry had hired, with a loan from the French king. As Richard’s horsemen began their charge, the pikemen withdrew and regrouped around Henry, setting up three rows of pike steel. It was this which broke Richard’s cavalry charge, and formed an effective bodyguard. Even so, Richard got to Henry’s battlefield standard, cutting it down and the standard-bearer with it. Richard was within feet of Henry, just beyond sword range, when Henry’s cavalry arrived in the rear of Richard’s knights. At that point, the battle could have gone either way, depending on which man, Richard or Henry, was killed first. Henry was the lucky one. The winner started the war crime story immediately – medieval bellingcat. Henry decided to strip Richard’s body; mutilate it; display it tied over the back of a horse which was led into the nearest big town; then disposed of in an unmarked grave. Henry’s portraits were touched up; Richard’s portraits disfigured; for details, read this. The recent recovery of Richard’s grave, coffin and remains has begun to improve the credibility of the evidence of what really happened. There’s plenty of time for the truth to win out, though Shakespeare’s version is still a best-seller, and most Englishmen want to believe nonsense about the last of the Tudors, Elizabeth the First, Good Queen Bess. It will take more than Black Adder to right her wrongs. 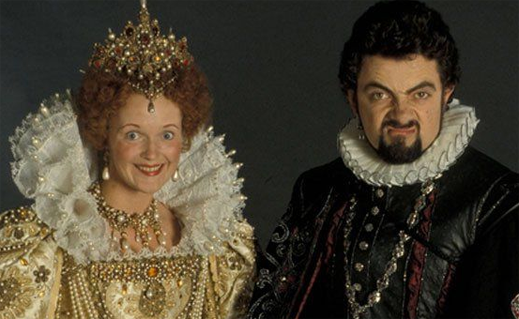 Rowan Atkinson (right) plays nobleman courtier to the corrupt and madly capricious queen whose misconduct was much worse than even the comedy allows. View this; then read this new history of what really happened by John Guy. So let’s not sit upon the ground and tell sad stories of the death of kings; how some have been deposed; some slain in war. If you aren’t German, not enough time has gone by to decide whether the bombing of Dresden (lead image, 2) was an Anglo-American war crime. So too the Battle of Aleppo, which marks the victory of the government of Bashar al-Assad. In case, dear reader, you feel too tender and too sore towards these events, wait then for five hundred or a thousand years. In the meantime, the significance of the Battle of Aleppo cannot be missed. There is a winner and there’s a loser. Luck and info-war have had had nothing to do with it.